and a great way of getting plant based protein in your diet. 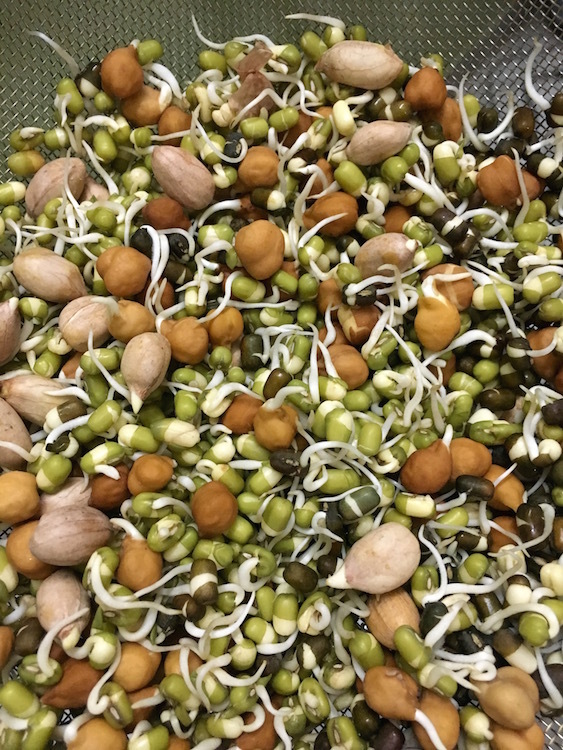 When we moved to an all vegetarian (+no milk +no wheat) diet, the one food our nutritionist emphasised on eating was sprouts. She had said, seeds have the potential to become a whole new plant and are one of the most nutrition packed food sources. Nuts, seeds, legumes and grains — everything that can sprout, should be sprouted. Though they are packed with proteins, vitamins and minerals, their nutrients are most accessible when the dormant seed starts to become a live plant. The outer covering often contains anti-nutrients which makes it difficult to absorb the nutrients present in the seed. 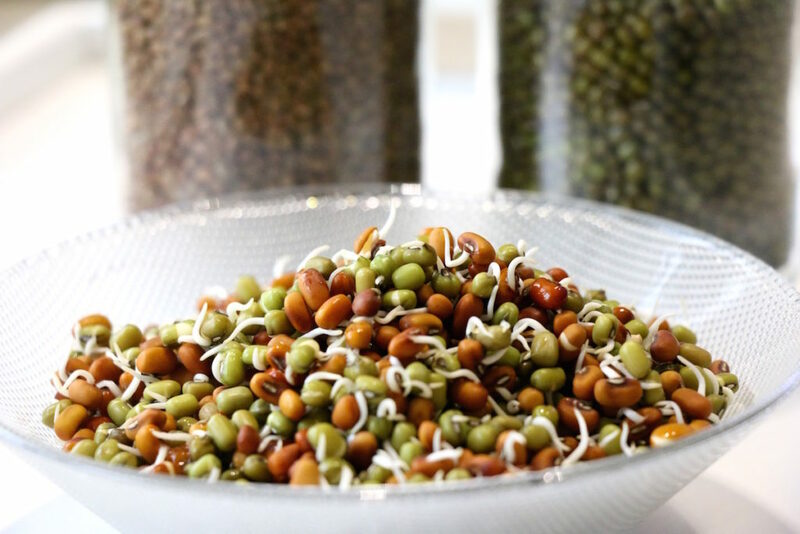 During sprouting the anti-nutrients are cast away and a powerhouse of nutrition is unlocked. 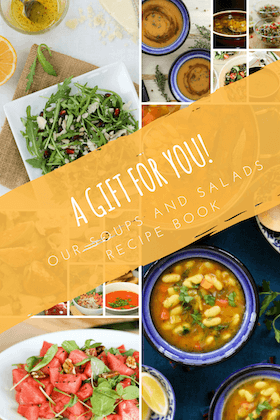 While many sprouts can be eaten raw, some, like chickpeas may need to be steamed/ bleached or boiled because they are hard to digest. One of the easiest legume to sprout is whole green moong daal. The same steps can be used to sprout any other legumes, seeds, grains and nut, though the sprouting time will vary. 1 cup of moong daal will yield about 3 cups of sprouts. For the two of us, I usually sprout just ½ cup at a time which lasts us for 2 days and by then the next batch is ready. Wash the moong daal 3-4 times till the drain-off runs clear. Soak the moong daal in slightly warm/ tepid water such that the depth of water is about twice that of the beans. Cover and let it sit for 8 hours or overnight. The beans are ready to sprout when they are plump and the outer green skin has just started to split. Drain off the excess water. Put the wet moong daal in a clean muslin cloth or tea towel. Tie the ends into a tight bundle. The beans need to be in a compact environment to sprout, so make sure they aren’t too spread out. This helps to retain the heat generated by the sprouting process. Place the bundle in a colander and put the colander in a dark, warm place such as a cooled oven or your kitchen drawer. Allow them to sit undisturbed for about 8 hours. Check the progress of the beans. Moisten the fabric if it has become dry. When the sprouts are about ½” long, they are done. Moong daals take about a day or two to sprout. Rinse and serve raw in salads or cook as a dry vegetable. The actual time will depend on many factors such as temperature, humidity and air circulation. Sometimes you may need to air them a little, or in winters you might actually need to put them in a slightly warmer place. After a few attempts you will find the right combination for your kitchen and environment. Sprouted wheat after 1 day. 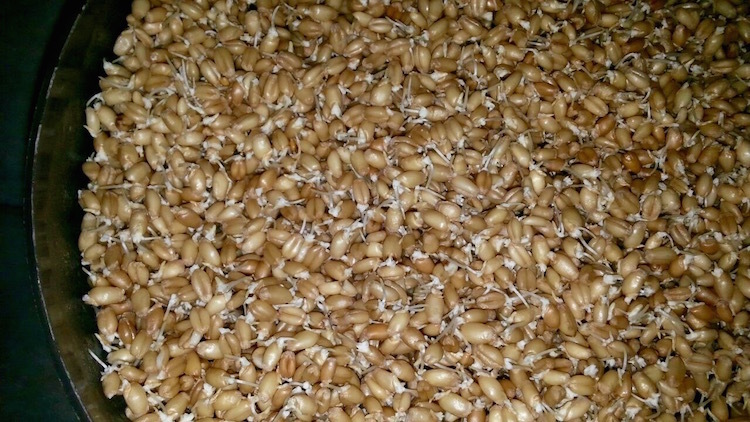 Wheat took nearly 3 days to sprout properly.